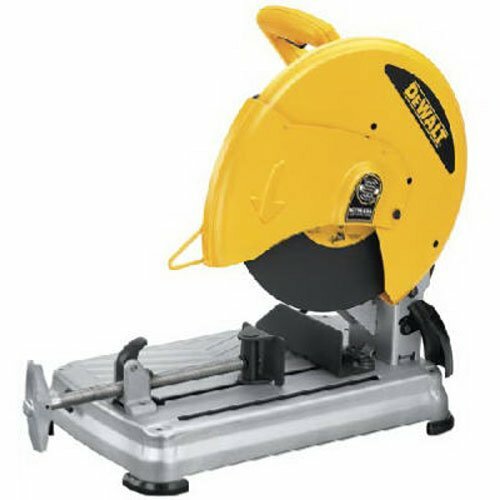 Technically, a chop saw is a fast-rotating circular saw that’s attached to a pivoting arm and because it features mostly come with a powerful motor and a stable base, they work a lot faster and with more convenience than conventional saws. Also, since they feature abrasive discs without any teeth, they have a remarkable prowess for cutting rather effortlessly and quickly through the toughest materials, making them the go-to tool for contractors, builders, plumbers, mechanics, and even DIYers handling equally abrasive and tough materials. Before upgrading yours of purchasing your first, though, there are few factors to keep in mind to ensure you get one that best meets your unique cutting needs. These factors, together with a review of ten of the best chop saws on the market follow in the next paragraphs. 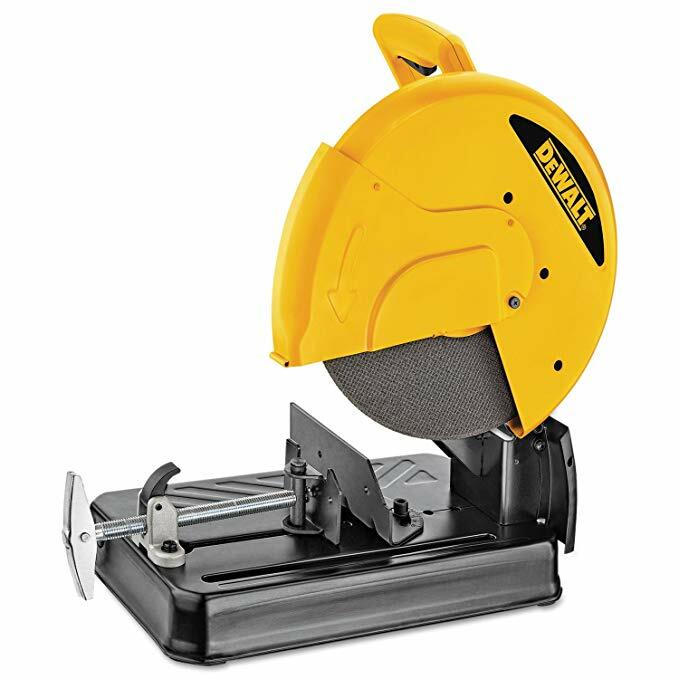 For the DIYers and professionals metal workers looking to introduce speed into the mix, the DEWALT DW872 is the chop saw to go with. The chop saw is 200 rotations per minute faster than our previous pick and up to four times faster than the vast majority of chop saws on the market, which makes it the all-time favorite of metal workers looking to complete any heavy-duty metal building, framing, or cutting project in a fraction of the time and effort it takes with standard models out there. The compact and heavy-duty construction of the machine, coupled with its ease of use and accuracy makes it your best bet for clean and accurate cuts, irrespective of the material you’re dealing with. As with all things DeWalt, this saw epitomizes high-quality construction and offers nothing short of the best performance. This model specifically, has a remarkable knack for slicing effortlessly, accurately, and quickly through steel and other non-ferrous materials, without the slightest indication of the motor straining. The high-performance 4 HP, 15-amp motor significantly enhances performance and durability by providing additional overload capacity. Consequently, it easily reaches speeds of up to 4,000 rotations per minute, making it eight times faster than a portable band saw. Italso has a heavy-duty and exceptionally performing 14-inch, 70-tooth carbide tipped blade that makes it a very versatile choice for use on a wide range of projects and materials. And the beauty of going with the carbide teeth as opposed to the several available alternatives is that they cut quickly, precisely, and without any burrs, allowing you to achieve the best results possible. It boasts an incredibly large capacity ideal for taking on a wide range of projects involving any material sizes. With it, replacing the blade is a breeze, thanks to its spindle lock. There is similarly an on-board storage for safely keeping the change wrench and the ergonomic handle is strategically positioned to minimize hand strain. And to top it all off, you get a generous 36-month warranty to cover for deficiencies in material and craftsmanship. At its price, we dare say the DW872 is quite a steal. The Evolution Power Tools Rage2 comes with a slew of signature features starting from versatility, ease of use, affordability, durability, to high-performance. Its versatility, however, overshadows these attributes considering that it slices through a wide range of materials both soft and abrasive quickly and with lots of ease. It is a solid choice for professionals and DIYers who handle several materials like plastics, steel, aluminium, and even wood, all without having to change the blade to suit the hardness or softness of the material. Enough with the overview. Behind every high-performance chop saw is a powerful motor that works smoothly, reliably, and for the most part, quietly. That statement is especially true for this tool, seeing as it packs a powerful 15-amp motor boasting no-load speeds of up to 1450 rotations per minute. The machine is so powerful that it powers through pieces of wood with nails with minimal hesitations, a fete that most chop saws would freeze trying to accomplish. It uses a heavy-duty 14-inch multi-purpose 36-tooth TCT blade, which means there is no point in changing it as you shift from one material to another. As a result, you conveniently get to use the same blade with virtually all materials, from mild steel, aluminium, to wood. A unique selling point of a multi-purpose TCT blade is its ability to cut efficiently and smoothly with no heat, burrs, or sparks at the end of which you get a superior quality finish. There are additional features worth bringing to your attention, the first of which is the hi-torque motor gearbox that in addition to reducing motor stresses, enhances the performance and longevity of it. The machine also incorporates an easy-to-use swivel clamping mechanism that allows for mitre cuts 45 degrees to the left or right. 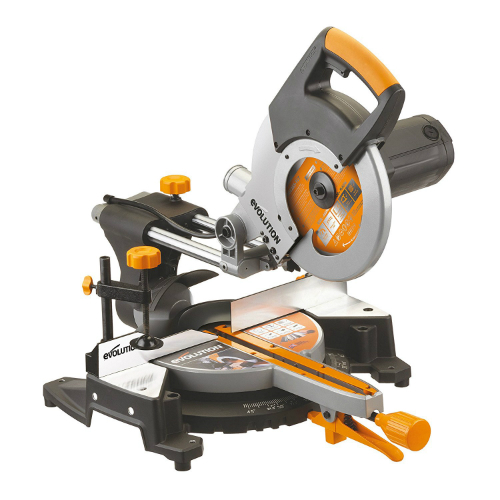 And expectedly, the saw is relatively lightweight and compact, and as a result, very portable. For the seasoned professionals and extreme DIYers in search of an all-around option for undertaking light-duty to heavy-duty projects, you’re number 1 consideration needs to be the Evolution Power Tools RAGE2. It has a knack for working safely, efficiently, and quickly, producing the cleanest cuts in the process. For users looking for an option that performs accurately and efficiently, and boasts incredible accuracy, let's introduce to the workhorse that's the Makita 2414B. The machine features a high-end construction quality to withstand the wear and tear and the other rigors that come with cutting through abrasive materials like metal, concrete, and bricks, among other materials. Unlike cheap, off-brand models on the market, it doesn’t come with any teeth, allowing it to cut with admirable ease and speed through the toughest materials such as steel, re-bar, and even cast iron. When you need to cut, build, or frame with tough materials, this option should be your to-go tool. It brings together several instrumental features to provide the user with the best performance, both around the house and on the construction site. It combines a heavy-duty 14-inch disc with a powerful 15-amp motor capable of 3,800 rotations per minute to make it an ideal choice for users undertaking heavy-duty applications. The machine also boasts legendary flexibility considering that it easily adjusts between 90 and 45-degrees on both sides for the perfect angled cuts. It also easily accommodates different workpieces, both regular and awkward, thanks to its 3-position adjusting fence. Hand fatigue or strain is a thing of the past when you haveit in your workshop as it features a double insulated motor that effectively dampens vibrations and minimizes overheating when you undertake heavy-duty projects. To these add the fact that the machine is relatively lightweight and compact and hence very portable, weighing a paltry 40.6 pounds with dimensions of 19.7 by 11 by 23.6 inches. Additionally, there is a handy, ergonomically designed D-shaped handle that offers a firm grip and a lock-off switch for preventing the chop saw from starting accidentally in between uses. Other outstanding features are the guard that diverts sparks from your line of view and a shaft lock that provides for quick changing of the wheel. And to enable you to make repeat cuts both efficient and quick, the machine features an innovative quick release vise that securely holds the cut material in place. If there is a specific feature you're looking in a chop saw, you're likely to find it with the Makita 2414B. It works as advertised and meticulously to provide you with the very best performance and experience. It comes highly recommended. Rounding up the list of ten of the best chop saws on the market is yet another heavy-duty, cost-effective, and smooth-running machine; the Bosch 3814 14-Inch Abrasive Cut-Off Machine. For all those heavy-duty cutting and metal framing projects, it should be your to-go tool, especially considering the ease, speed, and accuracy with which it shears the toughest materials. The high-performance motor provides remarkable speeds of up to 3,900 rotations per minute which, coupled with the over-load protection feature, makes short and quick work of the heaviest and most complex projects. And the likelihood of your workpiece falling off in the course of cutting is literally non-existent as the machine comes with heavy-duty locking vise that holds the pieces firmly in place, meaning that you’ll be cutting the pieces quickly, efficiently, and confidently. Another distinct feature is the effort and time-saving spindle locks that allows for quick changing of the wheel. Also, the machine operates with remarkable quietness and smoothness, thanks to the ball and roller bearing design that dampens the noise and vibrations. You'll also be able to cut precisely with the incorporation of a useful adjustable depth features that eliminates guesswork. And the icing on the cake is the adjustable fence that adjusts between 0 and 45-degrees to allow for angle cuts. In all, like our previous picks, the Bosch 3814 has all the essential features professionals and seasoned DIYers look for in a chop saw. It's cost-effective and remarkably easy to use. As a rule of thumb, only the best chop saws yield the best results, and the mantra is especially true in the case of the Porter-Cable PCE700. The 15-amp motor works dependably and smoothly and doesn’t strain even slightly when the machine is subjected to more abrasive and tough loads. It manages remarkable speeds of up to 3,800 rotations per minute and packs replaceable brushes that significantly enhance performance and durability. The user also gets to save lots of energy and time by using the quick-release clamp, which has since become almost ubiquitous now. The clamp does an astounding job firmly securing your workpiece in place and makes it just as easy and quick to remove it after the cutting. And when you need to change from one blade to another as you change your workpieces, you can quickly do so with the strategically placed spindle lock. The features bring to an end the days when you had to use a wrench or one of such special tools. It is designed to provide the user with the most accurate and high-quality results, irrespective of the material they're cutting or framing. One such instrumental feature is the cutting fence that features miter adjustments, enabling the user to quickly, efficiently and accurately make angled cuts up to 45 degrees. The design and engineering also aims to keep you safe and secure by one, providing a spark deflector that also ensures you invariably have a clear line of sight and two, by incorporating a heavy-duty steel base that guarantees it remains stable all during the cutting process. To conclude, the PCE700 has all the features that make for quick, effortless and efficient cutting of a wide range of materials. It’s a solid choice for professionals and DIYers in search of a cost-effective, lightweight, and dependable option. 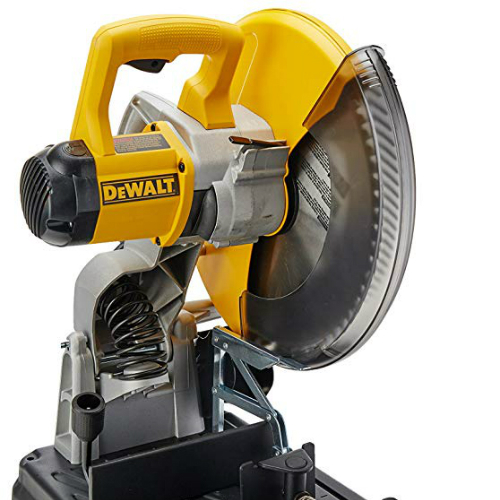 Like any other DeWalt product, this model has all the bells and whistles to remove the effort and time away from cutting, framing, and building with metal. It’s similarly versatile and works just as efficiently and smoothly with hardwood as it does with metal. It comes with a high-performance 15-amp/4 Hp motor with an overload protection feature that substantially increases its performance and longevity, while powering effortlessly and without even the slightest hesitation through the toughest of materials. The performance motor works perfectly in tandem with the aluminium oxide grain wheels, allowing you to cut quickly and smoothly, producing burr-free and high-quality finishes. As impressive as that sounds, it is not all about performance. Unlike cheap, run-of-the-brand models on the market, the design also aims to enhance ease of use and portability. To this end, the machine comes with a handy quick-lock vise that provides for quick and firm clamping of differently sized workpieces, thereby dramatically increasing productivity for repeat cuts. There’s also a spindle that takes the time and effort away from changing wheels while the on-board wheel change wrench provides much-needed storage. That’s not all, yet. It incorporates an ergonomically designed “D” handle that enhances comfort and minimizes hand fatigue, allowing you to work comfortably for several hours on end. To these auxiliary features add a heavy-duty fence that pivots easily at 45 degrees, allowing you to make angle cuts accurately and quickly. And since the chop saw is just 39.2 pounds in weight and incorporates a comfortable top handle, it’s a highly portable machine you can easily take to any work site. The D28710 makes it a breeze framing and cutting through virtually all types of materials. It works efficiently, quickly and with minimal hiccups. It’s an ideal choice for framers, mechanics, contractors, and even fabricators. A DeWalt tool has never failed in its execution of a project, and that’s not about to change with the DeWalt D28715. Whether it’s crosscutting or standard cutting and framing, the performance of the chop saw is invariably outstanding, thanks to its sea of instrumental features. It works quickly, accurately and features a surprisingly simple and user-friendly interface. It comes with one major highlight; a time and effort-saving quick-change keyless wheel change feature, which makes the effort so darned easy. The quick-lock vise, on the other hand, is ideal for quickly and firmly securing workpieces, leaving minimal room for surprises during the cutting process. Whether the cutting pieces are regular or of awkward shapes, the quick-lock vise secures them in position, making for quick transitions and dramatically increasing efficiency. And the design does not limit you to 90-degree cuts. Because the fence is able to pivot to 45-degrees, the user can quickly and accurately make angle cuts, making it a versatile and easy-to-use chopping saw options on the market currently. It is also highly customizable, allowing for the convenient welding of jigs or stops onto the base in a fashion that best suits the user's frequent applications. The ergonomic D-shaped handles, on the other hand, are perfect for snugly positioning your hand to minimize hand exhaustion, enabling you to achieve more productive and accurate cuts. Another highlight is its user-friendly design that facilitates portability and easy transportation. Unlike some models that’re both heavy and bulky, it weighs just 39 pounds and will take up minimal storage space in your garage or warehouse as it has compact dimensions of 24 inches by 15 inches by 16.5 inches. And since it features a handy top handle, carrying it around the workshop or to the car should be a snap. We’re saved the best feature for last; performance. It sports a high-performance 15-amp/5.5 HP motor that aside of delivering astounding no-load speeds of up to 4,000 rotations per minute, also comes with an overload protection feature. 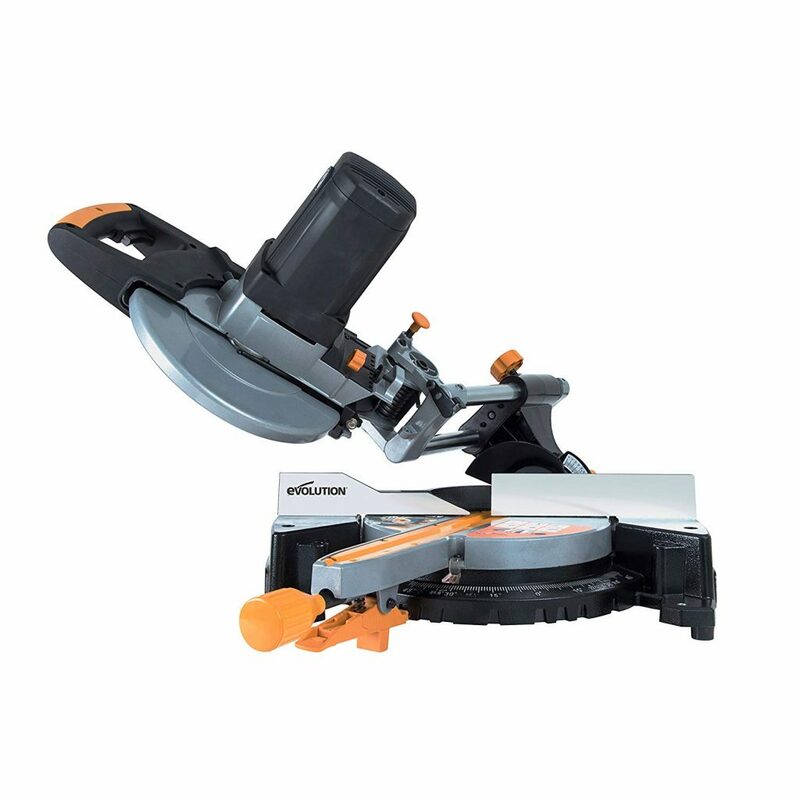 The latter feature makes the machine a perfect choice for working on a plethora of pieces and thanks to the 14-inch wheel, you’ll be achieving the most accurate and square cuts moving forward. In all, you’ll love the powerful performance, the practicality, ease of use, and versatility of the D28715. And you don’t have to break the bank to afford one. The LC1230 is yet another flagship chopping saw from the Makita, one of the industry leaders in the manufacturer of high-end, practical and functional chopping saws. And like its brother or sister we reviewed earlier, the machine boasts volcanic performance and is jam-packed with a litany of features and specs to make short and quick work of shearing off the toughest metals. By working efficiently and as advertised, it invariably delivers a remarkable finished product, deficient of burrs for which cheap, flimsy chop saws are notorious. Like most high-end options, it aims to deliver nothing short of clean, high-quality results, and to this end, the machine invariably provides remarkable results. It packs a powerful 15-amp motor offering speeds of up to 1300 rotations per minute. Couple the outstanding performance with the machine's no-load motor and you have a tool that takes the effort and time away from cutting through ferrous and non-ferrous metals. Also, because of the no-load motor, both the saw and the sawblade get to last for more than a lifetime with proper use, care, and maintenance. Another unique selling point that makes it particularly appealing to the vast majority of craftsmen, handymen, and contractors is its ability to make miter cuts to 45 degrees. The feature combines with the no-load motor mentioned earlier to enable the motor run both smoothly and powerfully, which in turn makes the machine ideal for handling a wide range of metals. In spite of the incredible performance, it happens to be one of the few options with a gentle learning curve. Within the first 30 minutes of having one, setting it up, operating, maneuvering, and storing it away safely at the end of a busy day should be a breeze. Changing the saw blade, for instance, is both easy and a snap as it comes with a handy socket wrench that takes the time and effort away from the endeavor. In the same vein, it features a two-finger trigger and a lock-off button that both aim to increase safety, with the latter preventing any accidental starts. Additional features include a tool-less plate and quick release vice. A professional craftsman who multitasks and needs an all-around tool for working with a wide range of materials should seriously consider the LC1230. It's one of a handful of chop saws that perfectly marry performance and convenience, thereby delivering the best cutting experience. 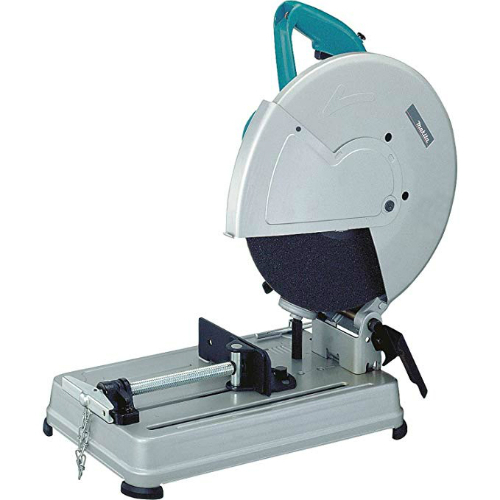 Following closely on the footsteps of the PCE700 is yet another Porter-Cable chop saw; the PC14CTSD. Like its brother – or sister – above, it provides incredible, volcanic performance in spite of its simplistic, humdrum physical attributes. With a high-performance and reliable 15-amp motor capable of attaining speeds of up to 3,800 rotations per minute, it effortlessly makes short and quick work of the toughest and most challenging cutting applications. It has the much-needed heft, muscle, and rugged longevity to power quickly and accurately through cast iron pipes, angle irons, threaded rods, conduit, square tubing, and several other abrasive materials. 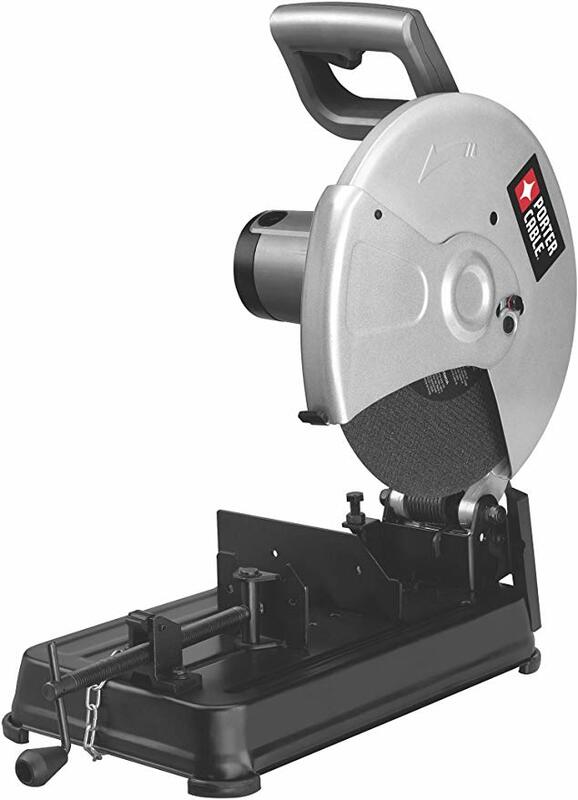 Still on performance, the saw comes with a heavy-duty fence that's able to effortlessly and quickly miter to 45-degrees to the left or the right. As a result, angle cuts is a snap with the machine, a fete that would be a tall order to replicate with cheap, flimsy tools on the market masquerading as chop saws. And to top it all off, there is a strategically placed spindle lock that takes the time and effort away from changing blades. Altogether, these features explain why it is such a hit with the vast majority of carpenters, metal workers, contractors, plumbers, and the extreme DIYers out there. Porter-Cable also aims to enhance ease of use and user comfort by incorporating a host of convenience features into it. One such feature is the D-shaped handle that’s ergonomically designed to minimize user exhaustion. Consequently, you can use the chop saw for several hours on end without experiencing any discomfort. Additionally, like our previous pick, the unit sports a convenient quick-release material clamp that works seamless and with a charm, as advertised. It provides for a secure and firm holding and quick release of the cutting material, irrespective of its shape, which allows the user to quickly make repeat cuts. Additional features include the heavy steel stable base, a guard and spark deflector for keeping you safe while enhancing your line of sight. And to keep everything neat and organized, the chop saw comes with a convenient on-board tool storage as well as a storage chain assist. For professional or DIYer looking for a heavy-duty chop saw built to last while offering remarkable performance and with a budget-friendly price tag, take another look at the PC14CTSD. The machine easily exceeds performance and longevity expectations, making it one of the better chop saws out there. You can never discount the significance of stability and power in achieving efficiency and accuracy when working with a chop saw. And the first step towards achieving these two is investing in a high-performance, durable, easy-to-use and versatile machine. And no machine fits that description like the Hitachi CC14SFS does. When it comes to chopping, building, or framing with ferrous and non-ferrous metals, it’s the chop saw you always want to use. And here’s why. At a time when less-established manufacturers are resorting to using less powerful and erratically performing motors to keep costs down, Hitachi goes all the way. Their leading flagship sports a powerful and dependable 15-amp, 2,000-watt motor that easily and quickly attains no-load speeds of up to 4,000 rotations per minute. With such immense power, cutting pipes, rebar, and shaped steel will be both quick and walk in the park. The speeds of the chop saw pair nicely with its 14-inch cut-off wheel that, with its impressive range, makes short and quick work of the toughest materials on a construction site. As for ease of use, it is arguably the undisputed king of the playground, packing several convenience features to make an otherwise onerous, energy-draining, and time-consuming endeavor a snap. For instance, the machine comes with a useful fence for quickly adjusting the miter 45-degrees to the left or the right, making it one of the most versatile chop saws on the market. Furthermore, the machine sports a quick-lock and release feature that dramatically augments productivity, making it possible for the user to feed and tighten a broad range of differently sized materials with ease and speed. The chop saw packs more incredible features. The likelihood of suffering hand exhaustion or strain is very minimal when you're using it. It features a comfortable and easy-to-use ergonomically designed D-shaped handle that substantially enhances productivity and accuracy. For safety, the unit comes with a trigger switch that features a lock-off button to stop the machine from accidentally starting up and an adjustable spark chute that diverts sparks from reaching you or obstructing your field of view. Additional features include a spindle lock and externally accessible carbon brushes that provide for you to easily and quickly mount and remove the cut-off wheel and effortless changing of the brushes, respectively. The portability, performance, and versatility of the Hitachi CC14SFS are exceptional. To that add a generous 60-month warranty and you have a machine that's optimized for a wide range of tasks like woodworking, metalworking, drilling, cutting, and fastening, among others. And it features a cost-effective price tag for those working on a budget and manoeuvres with ease, thanks to its portable and lightweight craftsmanship. If professional metal workers don’t walk willy-nilly into the first store they come across and use abracadabra to pick out a chop saw, why should you? 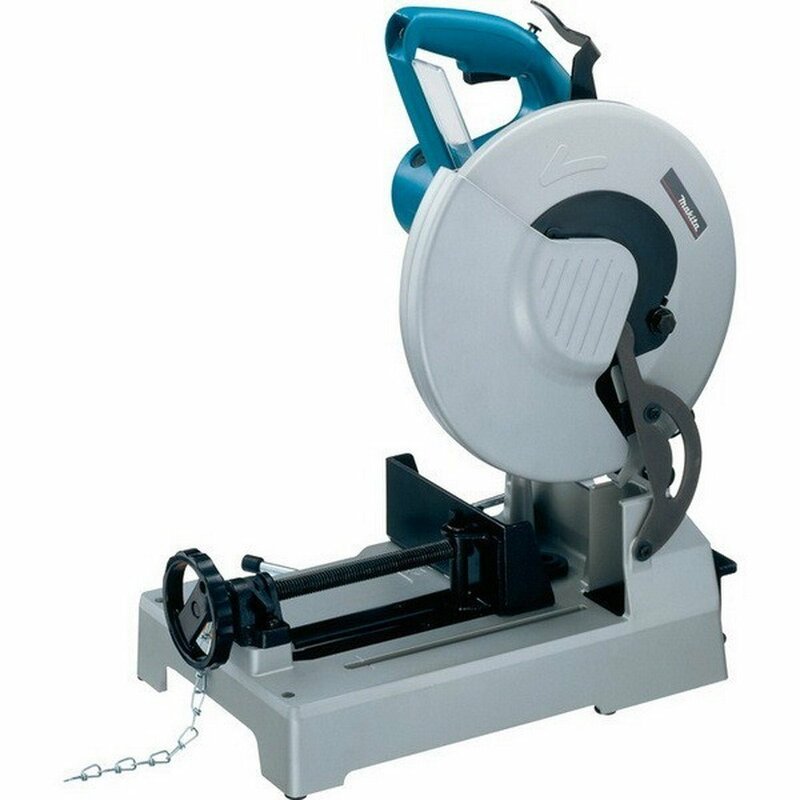 For effortless and quick performance, you need a multi-functional chop saw capable of handling a wide range of projects around the workshop. To that end, go for one with a powerful and reliable motor and impressive speeds. Something in the neighbourhoods of 15-amps with speeds of around 3800 rpm should suffice. In the same vein, it needs to feature a heavy-duty, pivoting fence to enable you to make accurate cuts at different angles. Shearing tough and abrasive metals, concrete and bricks is patently an onerous task, which makes it all the more important that you invest in a unit capable of handling the rigors of the trade. Heavy-duty construction ensures durability and stability. Check if the machine uses a blade or a wheel as the two have different longevities. It goes without saying that for those who intend to handle abrasive and rugged materials, you need a machine that accepts an equally if not more rugged wheel or blade to make quick and short work of the cutting process. Of course, you’ll have to dig deeper into your pockets but the effortless performance that comes with it is immensely rewarding. Most brands put a lot of thought into making user-friendly power tools and chop saws are no different. Most come with adjusting fences to easily accommodate regular and awkward workpieces while others come with double insulated motors that dampen vibrations and minimize noise. Still, others have ergonomically designed handles and are lightweight and compact to enhance convenience and transportation from one place to another. Other features to look out include spark deflectors, shaft lock for quickly changing the wheel, and the quick-release vise for firmly holding the workpiece in place. Q: Can I use a chop saw to cut through wood? A: Technically, yes. 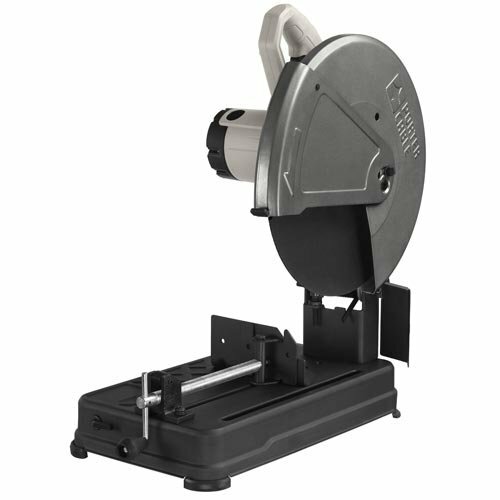 However, a miter tool is optimized for cutting through wood while a chop saw is designed specifically for shearing the toughest metals, concrete, bricks, and other abrasive materials. Q: How do I care for and maintain it? A: Maintaining a chop saw is a straightforward and easy endeavor. Cleaning it thoroughly after use, especially the blades, and lubricating the parts that need stay lubricated and occasionally checking to ascertain that all nuts and bolts are tight should do the trick. 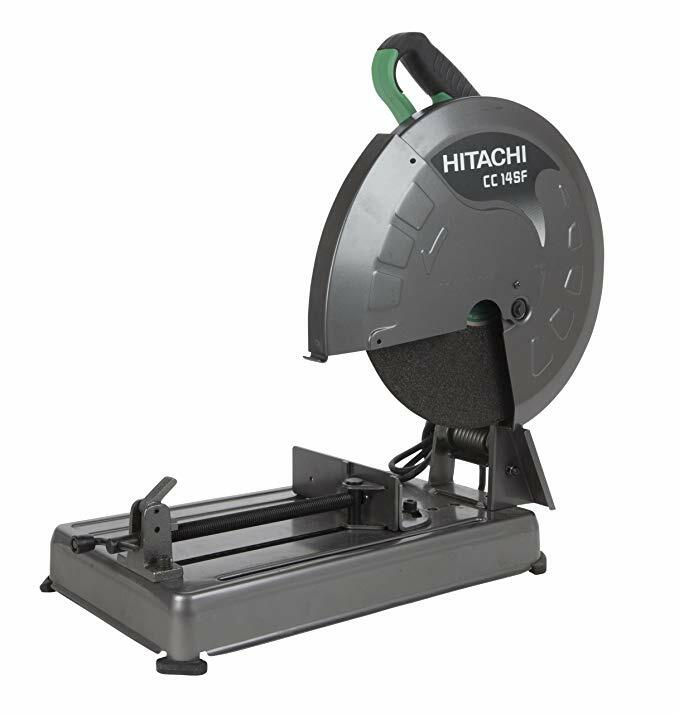 For professionals and enthusiastic DIYers searching for an efficient, quick, and accurate way of cutting heavy-duty metals, choosing your next or first chop saw should now be a breeze. Our list features some of the best on the market. They are durable, powerful, cost-effective, and remarkably long-lasting. Remember to wear the right protective gear before using yours, though.